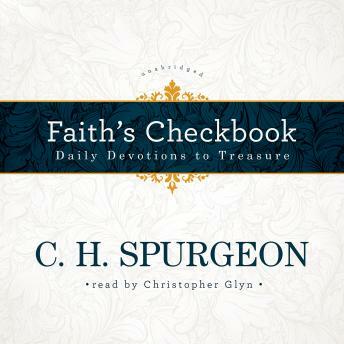 Faith’s Checkbook, written by world-renowned British pastor Charles H. Spurgeon, provides daily deposits of God’s promises into your personal bank of faith. Spurgeon urges you to view each Bible promise as a check written by God that can be cashed by personally endorsing it and receiving the gift it represents. Cash in on the bountiful store of blessings when you withdraw daily from the Bank of Faith. This captivating audio devotional offers inspiration and delight in our Lord, and it encourages listeners to take God’s promises to heart in two minutes or less per day. Narrator Christopher Glyn’s rich voice and English accent make Spurgeon’s simple, poetic, and deeply spiritual reflections and lessons come to life. Each verse is followed by a brief thought or application, making this audio collection ideal for personal or family devotions wherever you may go.